The other night I made a Japanese classic with some of my own additions. I made Shogayaki, ginger pork. 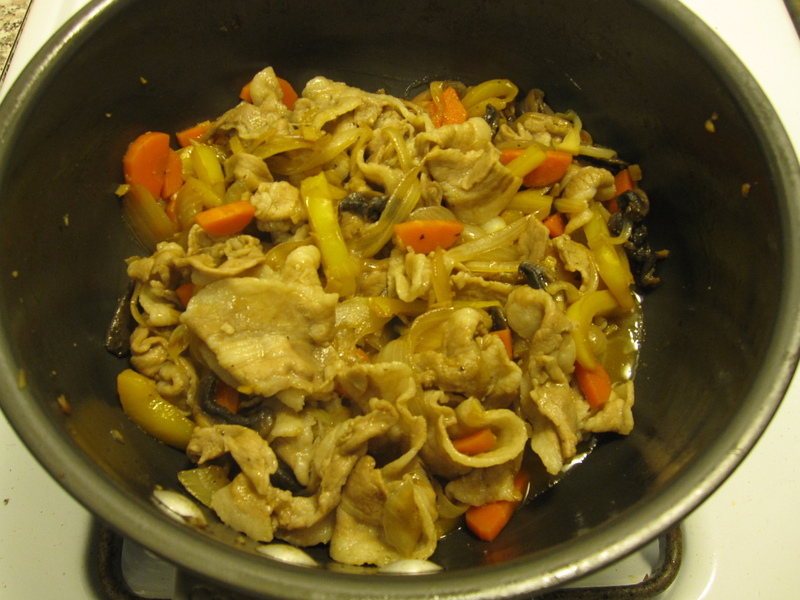 Typically made with just thinly sliced pork, ginger, soy sauce, mirin, and sake, I added a few vegetables into the mix instead of serving vegetables separately. This is an easy dish to make and very flavorful. 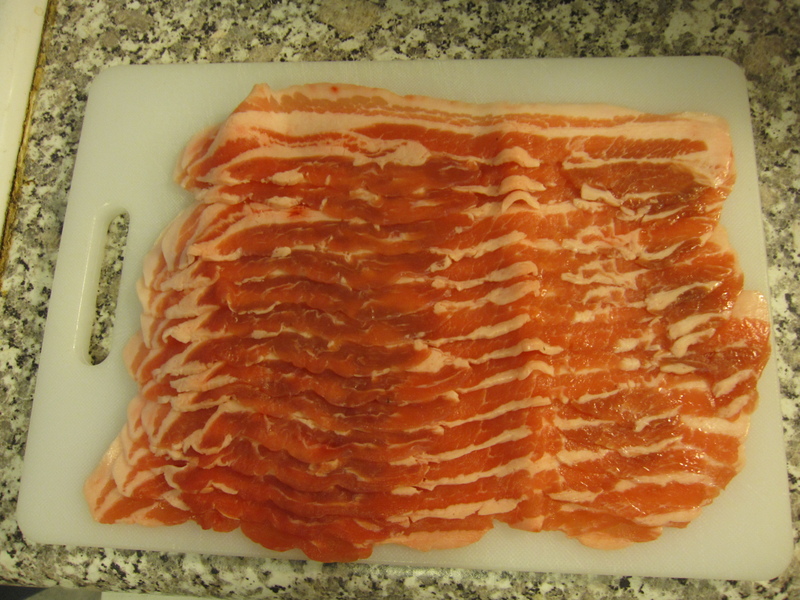 We picked up some really nice Kurobuta (Berkshire) sidebelly while at Mitsuwa. It came thinly sliced which is prefered for this dish. It doesn’t necessarily have to be thinly sliced, nor does it have to be belly. You could get some nice chops and cut them thinly yourself, just try to make them no thicker than about 1/8 inch. I cut the pork sliced in half since they were as long as bacon. That wasn’t necessary, just what I felt like doing. 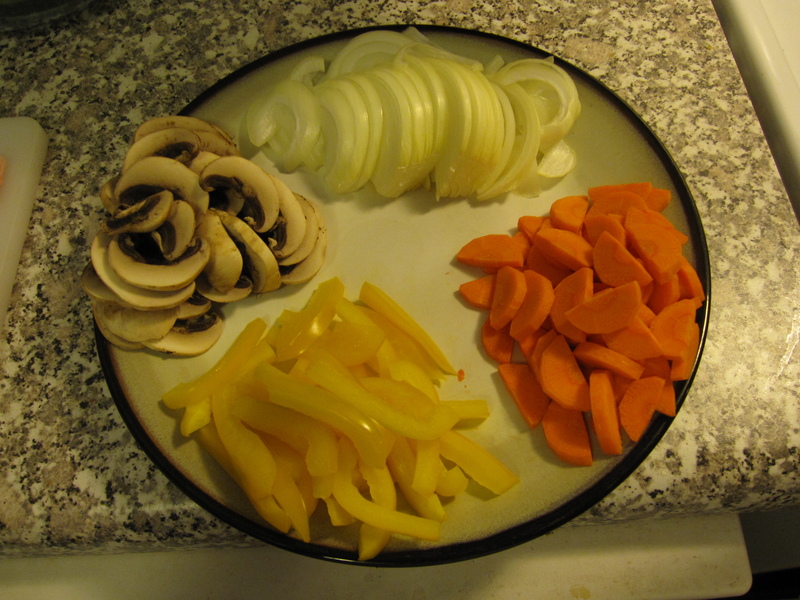 For vegetables I sliced half an onion, cut a carrot into half moons, sliced half of a yellow bell pepper, and slices a bunch of mushrooms. 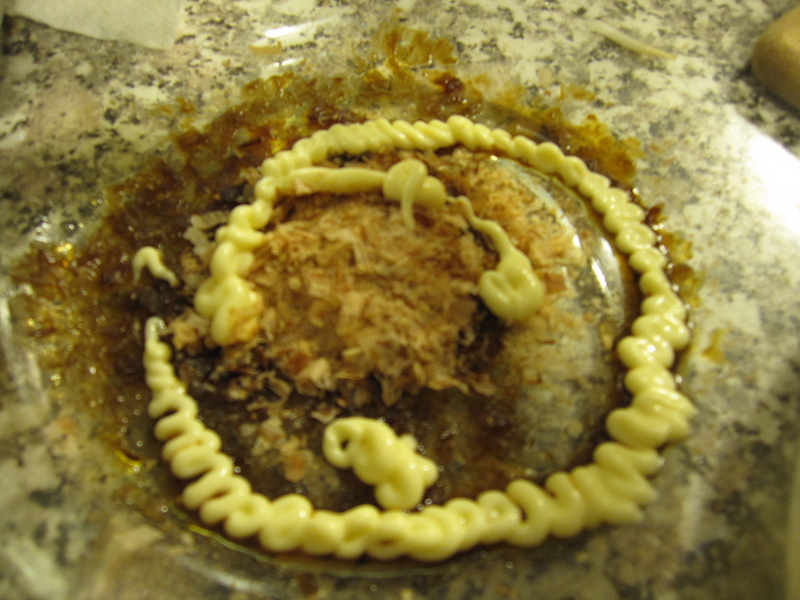 For flavorings I, obviously from the title, used some minced ginger, a couple of minced garlic cloves, and a sauce of 3 tablespoons soy, 2 tablespoons sake, and 1 tablespoon mirin. 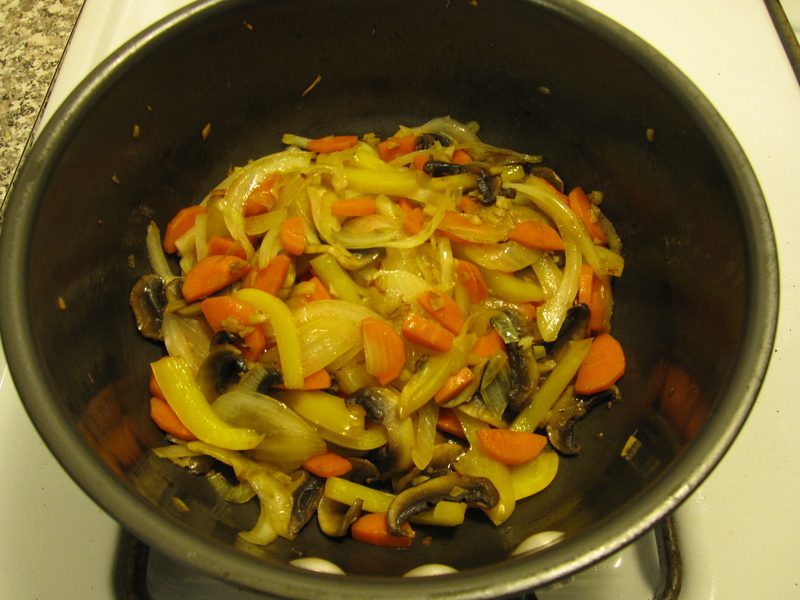 I started by tossing the ginger and garlic into a hot pan with 2 tablespoons of sesame oil and 2 tablespoons of soy oil. I let that go for just a few minutes until it became fragrant. 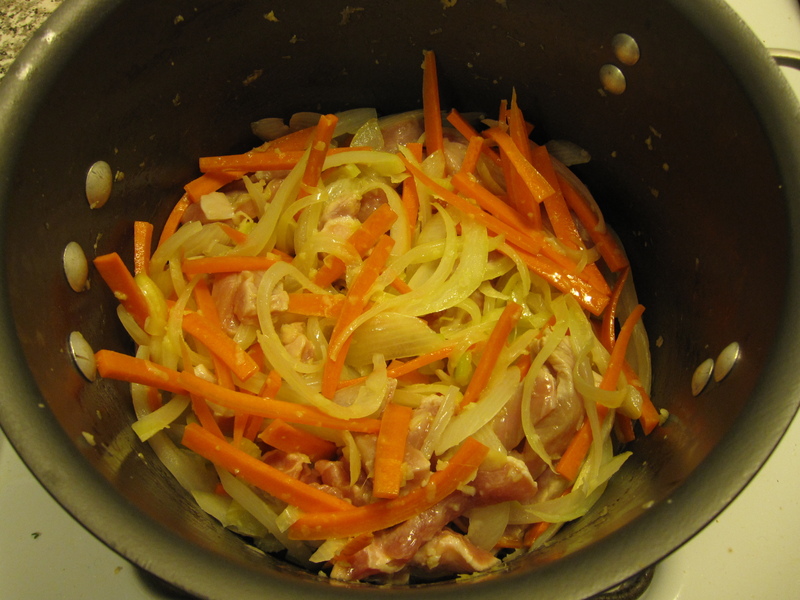 Then I added the onions for a few minutes. Followed by the carrot for a few minutes. Then the pepper for a few more minutes. And finally the mushrooms for another few minutes. 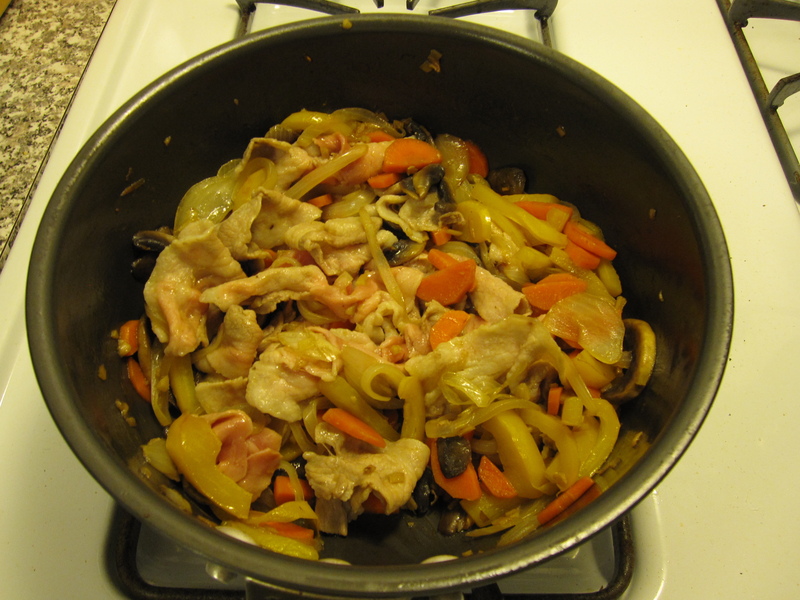 Once the vegetables were mostly cooked I added the pork. I mixed it all together and let it go for, you guessed it, a few minutes. Then I dumped in the sauce along with some black pepper. I covered the pan and turned the heat down to medium once the sauce started to boil a little. Every few minutes I stirred everything around. After about 15 minutes I uncovered the pan and let the sauce reduce a little. 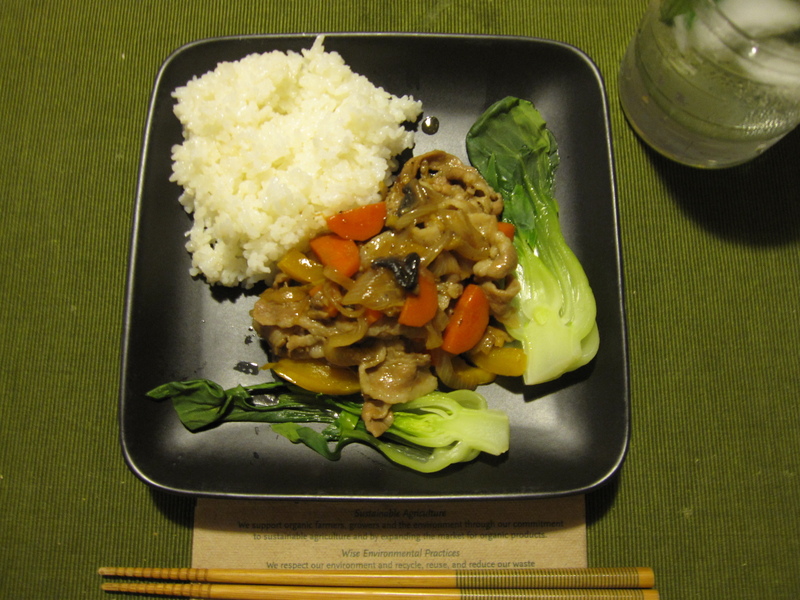 I served it once the pork and vegetables were evenly coated by the slightly thickened sauce. 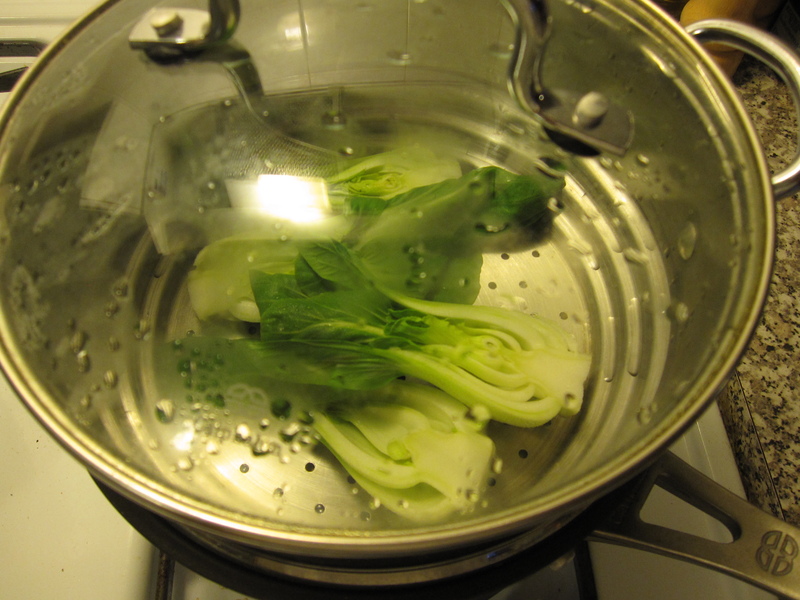 While the sauce was thickening I put a couple of baby bok choy that I had cut in half into the steamer. I let them steam for about 6 minutes. 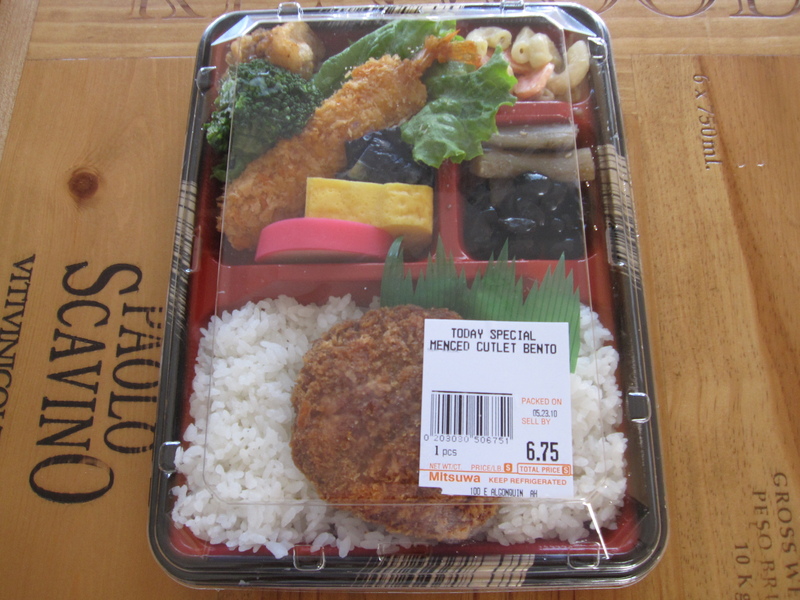 They were served next to the shogayaki with some white rice. 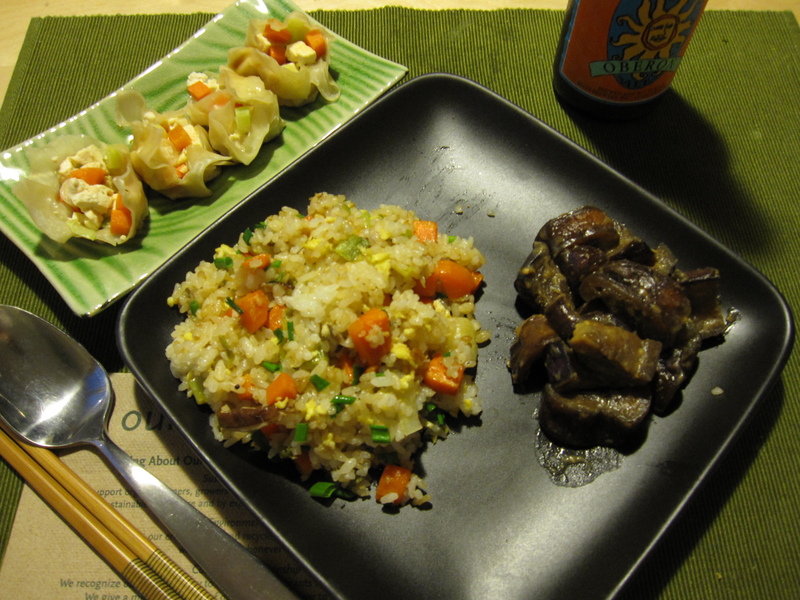 Last night’s Meatless Monday certainly wasn’t the prettiest of all plating, but I do have to say, my fried rice was excellent! First things first, making the shumai. 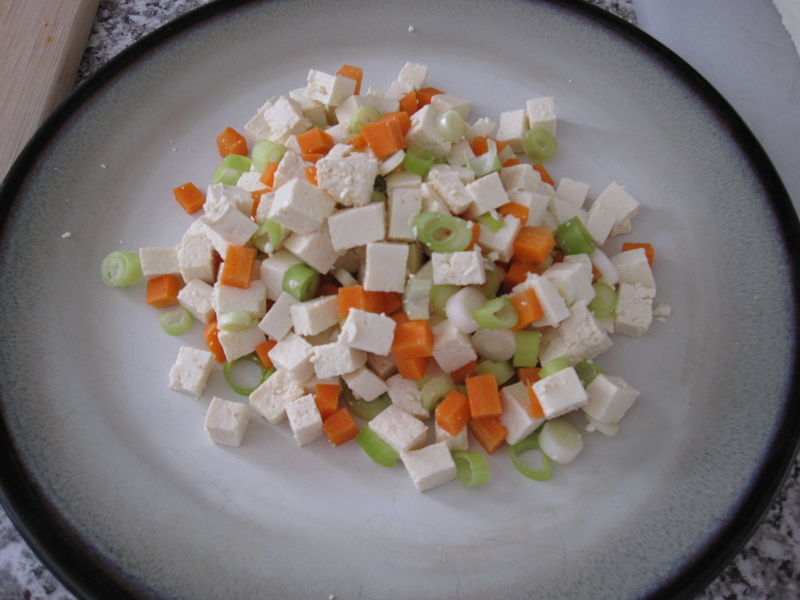 I simply took a half a piece of tofu and mixed it together with a small carrot and three green onions that were all small diced. 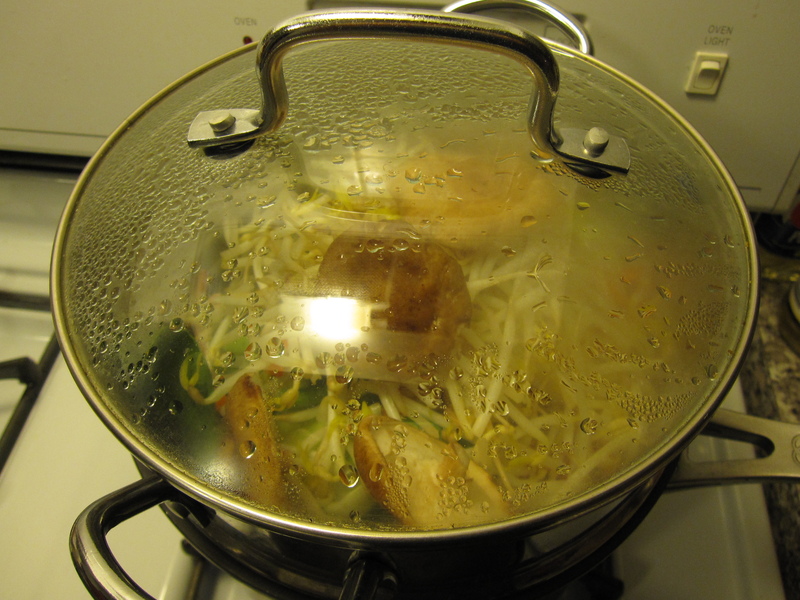 I folded it all into some wonton wrappers and then set everything aside to steam later. When it came time to steam them, I let them go for about 10 minutes or so. That left the carrots a little al dente to leave a little texture. For service, I drizzled the shumai with some ponzu. 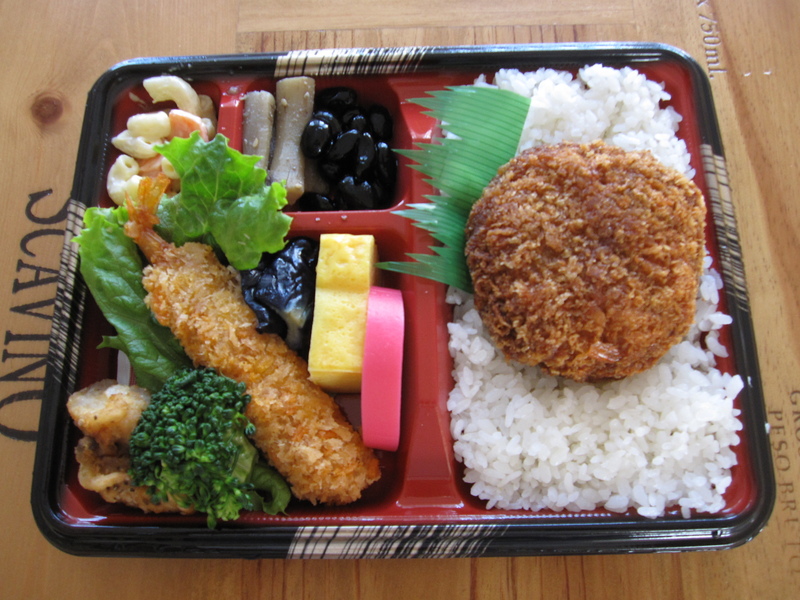 The miso eggplant is a classic Japanese home dish called nasu-miso. 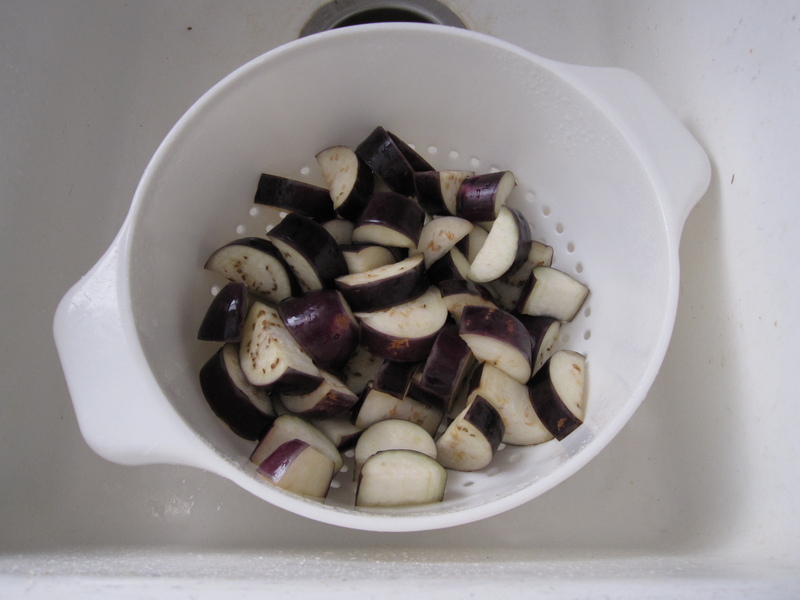 To start, I took two large Chinese eggplants, chopped them up into bite-sized pieces, then sprinkled them with salt in a colander. I let them sit for about a half hour to allow the bitter juices to drip out. Then I rinsed them off and squeezed them dry. 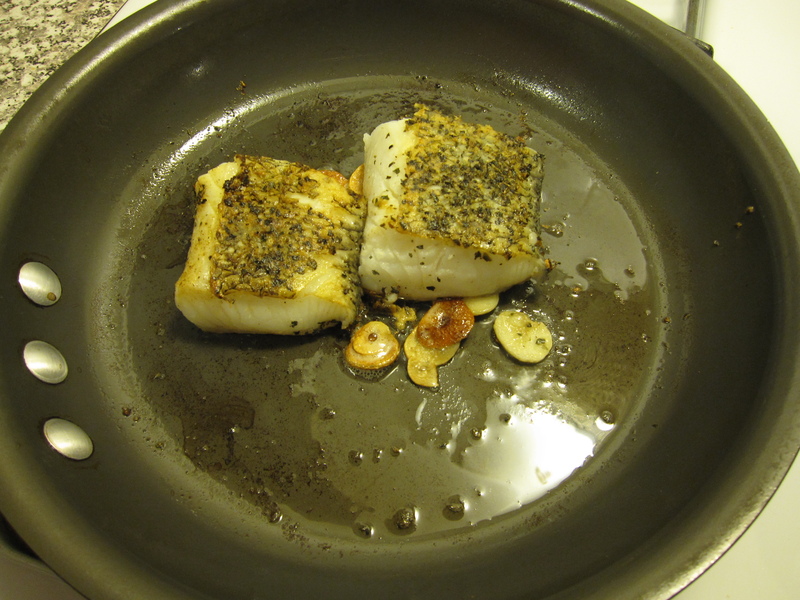 In a really hot pan I heated up about 5 tablespoons of sesame oil. As soon as the oil was smoking hot I added the eggplant. 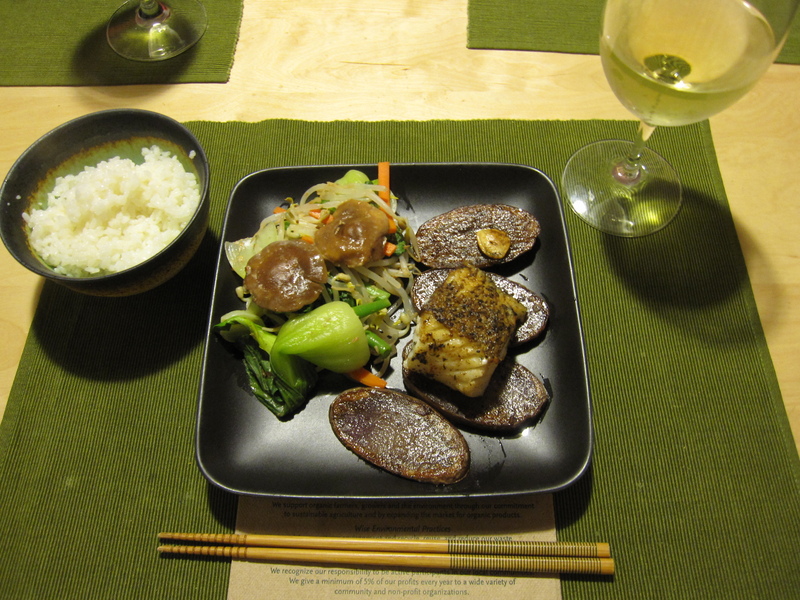 I wanted to wait until the oil was super hot so that the eggplant didn’t absorb it all. 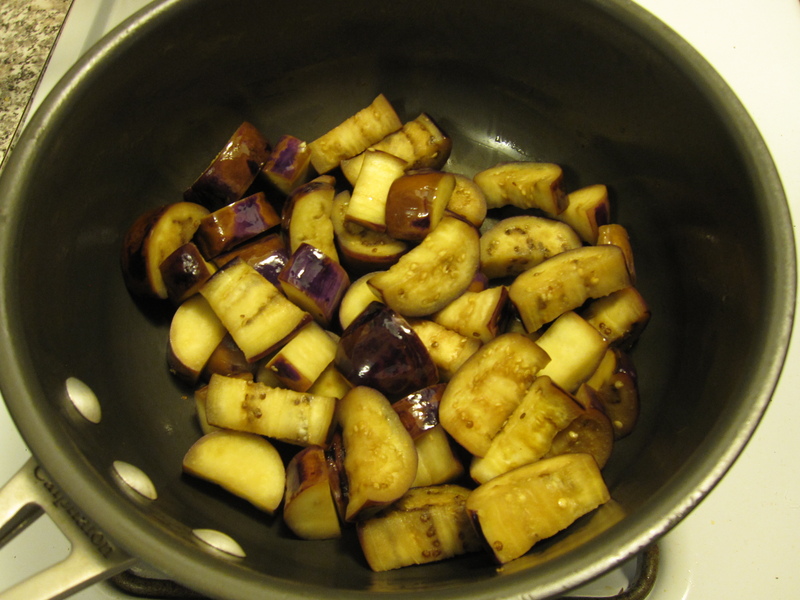 I fried the eggplant for about 8 minutes and then added a mix consisting of 3 tablespoons of sake, 1 tablespoon of mirin, 2 tablespoons of soy sauce, and 1 tablespoon of sugar. I let that boil down for a couple of minutes. 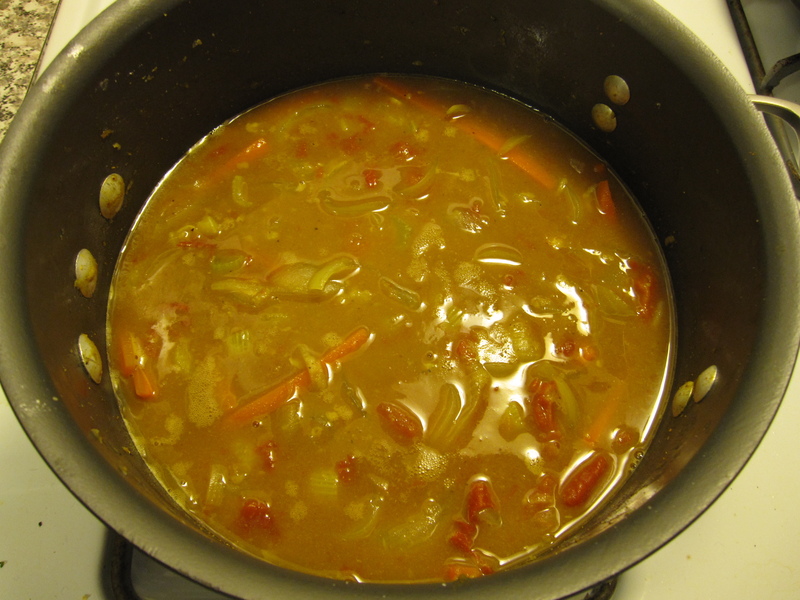 Once the liquid almost evaporated and absorbed, I added 2 tablespoons of miso that I diluted with 3 tablespoons of water. I mixed that all around and let it cook for about 2 more minutes before serving. 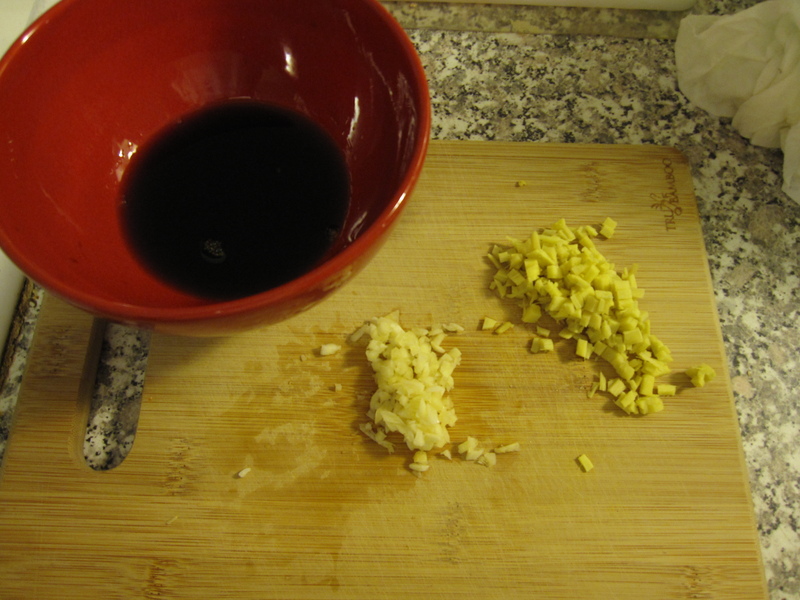 To make the fried rice I started by sauteing some ginger and garlic in peanut oil. 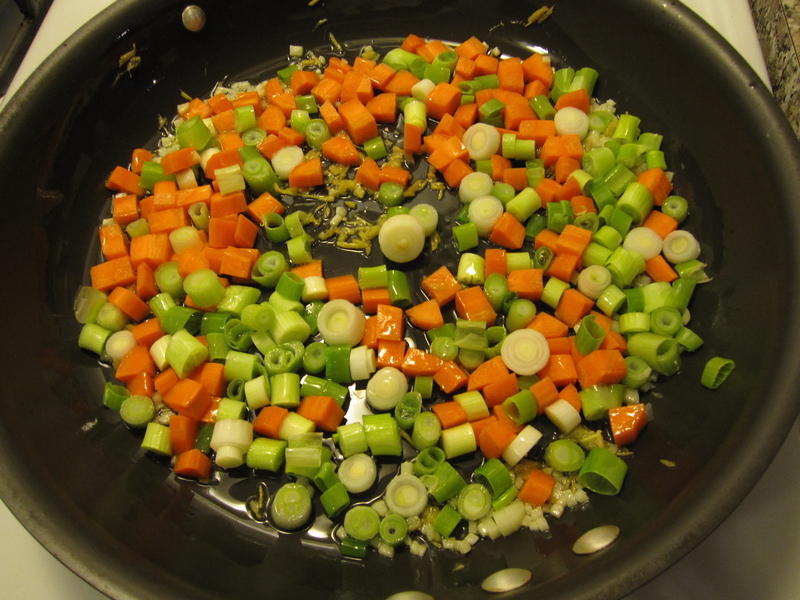 After a few minutes when they became really aromatic I threw in a diced carrot and 7 chopped green onions. 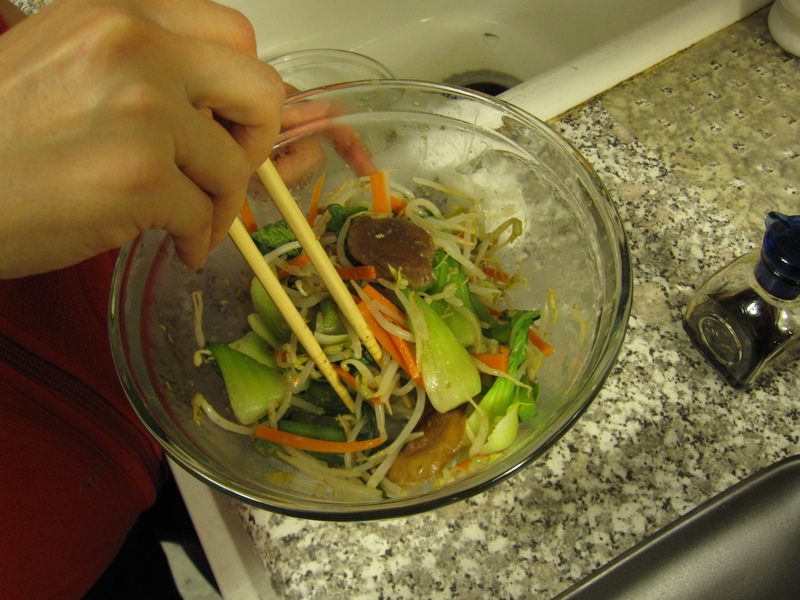 I let that all cook for about 7 minutes and then threw in a bunch of thinly sliced shiitake. That went for another 4 minutes. 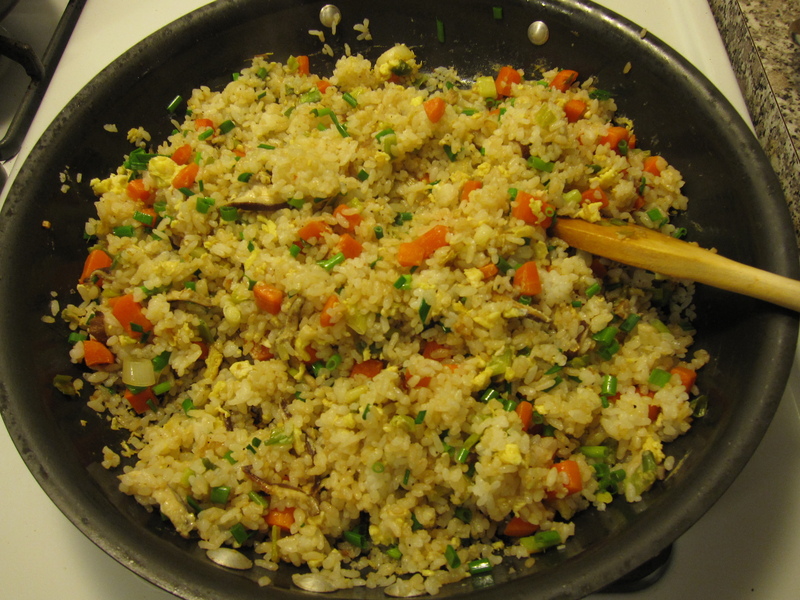 Typically, when I make fried rice, I will first make some scrambled eggs and set them aside to add right about this point. I forgot to do that. 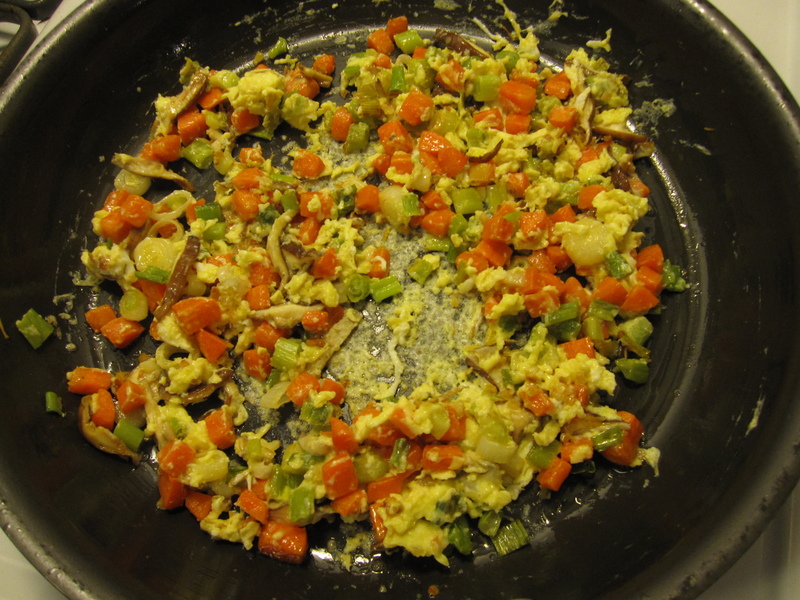 So, I just dumped two scrambled eggs on top of the veggies and fried them. I still works, but it’s not how fried rice is usually made. Once the egg was cooked I threw in 2 cups of rice that I had made earlier in the day and let cool. With a wooden spoon I continuously broke up the rice and stirred it all in to get an even mix and to allow all of the rice to fry a little bit. Once the rice is was all broken up I added a few tablespoons of soy sauce along with some black pepper and mixed it in really well. Then I tasted it for seasoning only to see that I needed a little more soy. So, I added a little more soy. It’s always best to start with less than you think you need. You can always add more, you can’t take any back at this point. 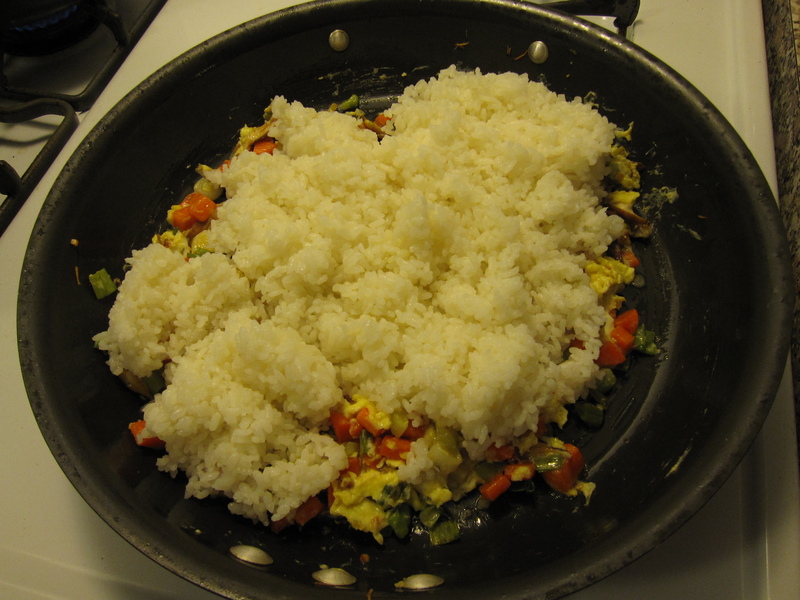 At any rate, the rice turned out fantastic! Oh, right before serving the rice I mixed in a bunch of chopped chives. We were at my buddy’s new place out in Jefferson Park and they have tons of chives growing in their backyard. So they gave us some for our cooking pleasure. So, I had a lot of pesto left from Meatless Monday. Whole Foods had local, organic chicken legs on sale for $1.49 a lb. The idea was to marinade them in the pesto for an hour and then grill them up. The spurts of rain we got last night put the kibosh on that. So, I roasted them instead. Before marinating the chicken, I slashed the skin a couple of times about halfway into the meat. 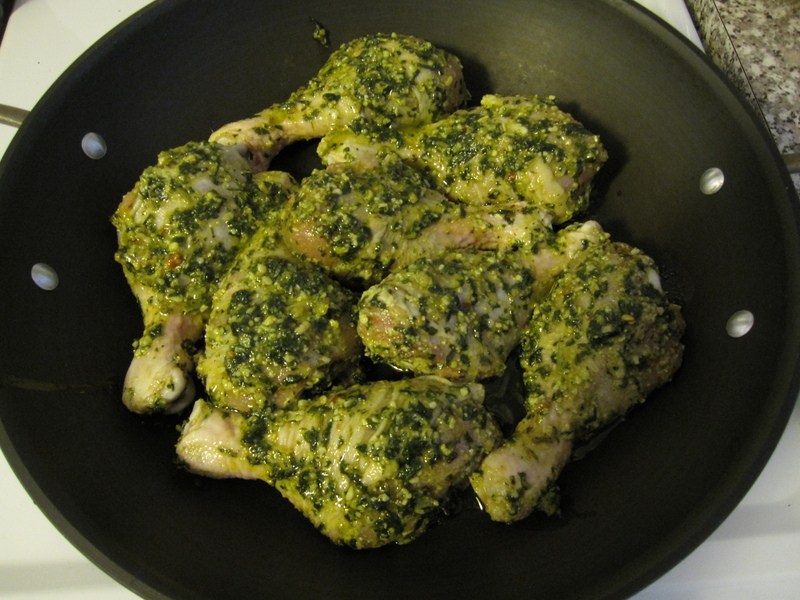 I wanted the pesto flavor to permeate the leg and not just coat it. I put the legs in one of my large pans and threw it into the oven at 425 degrees for about 35 minutes. While I didn’t get the smoky grill flavor I wanted, this allows the chicken to almost confit. All of the chicken fat helps keep the meat moist and juicy. 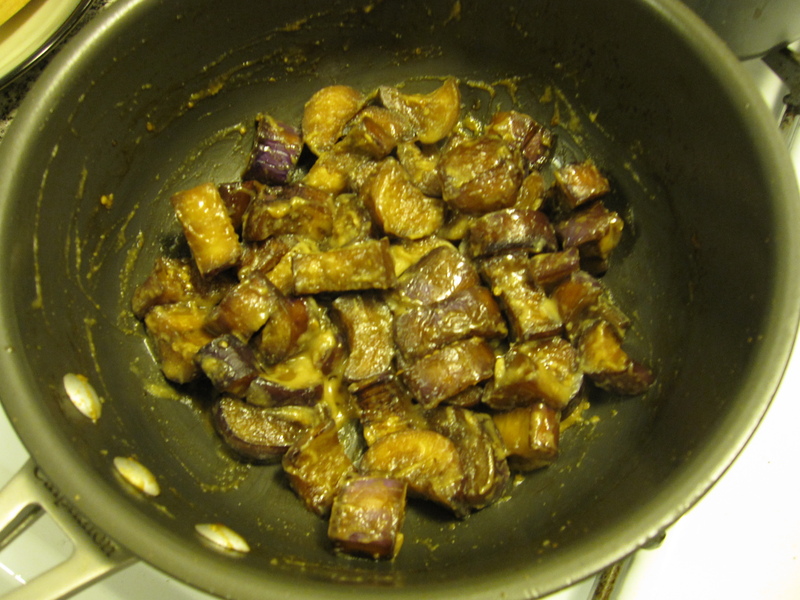 While the chicken was roasting I sautéed up some onion, purple potato, and carrot in butter. 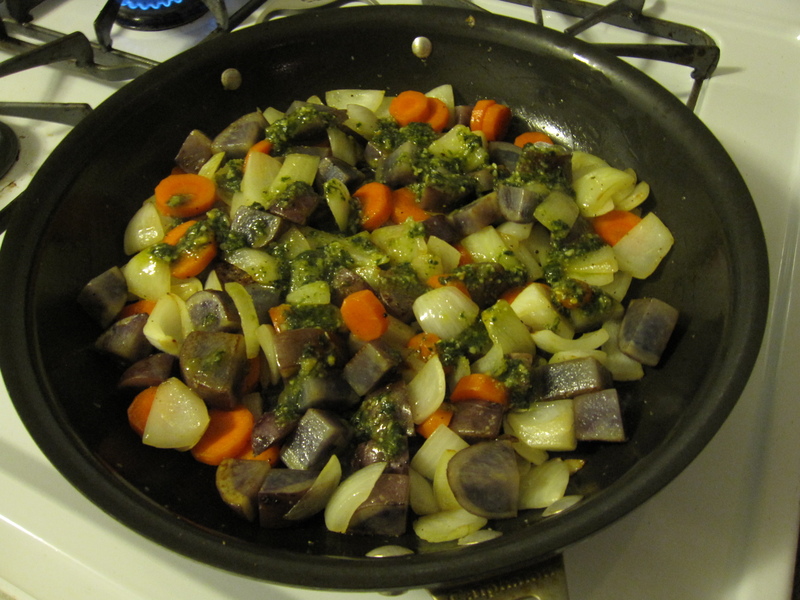 Once the vegetables were almost completely cooked, about 10-15 minutes for the potatoes, I drizzled in the last bit of pesto I had left. I let that cook for a minute or two. 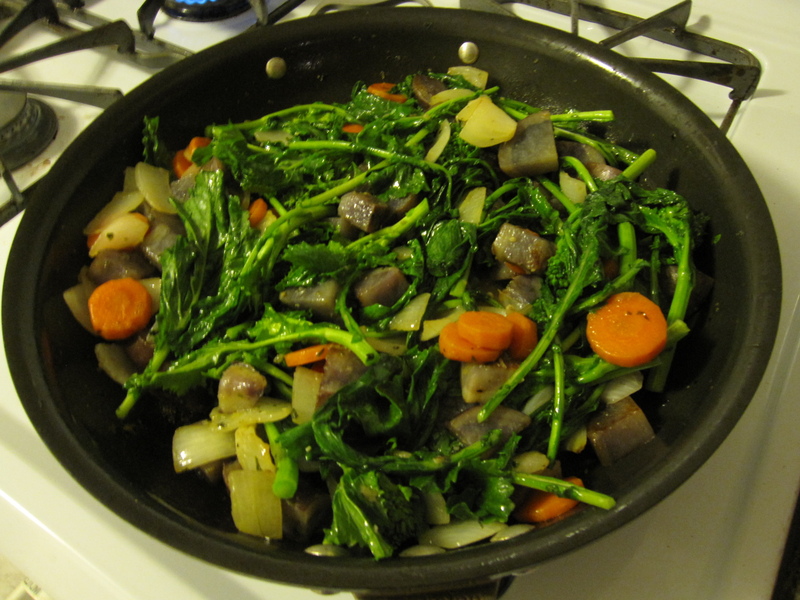 Then I threw in the rest of the rapini I had in my fridge. The rapini only needs a few a minutes. Once the leaves started to wilt I turned off the heat. I prepared the soup earlier in the day so that, come dinner time, all I had to do was heat it up. I took 7 roma tomatoes and halved them. 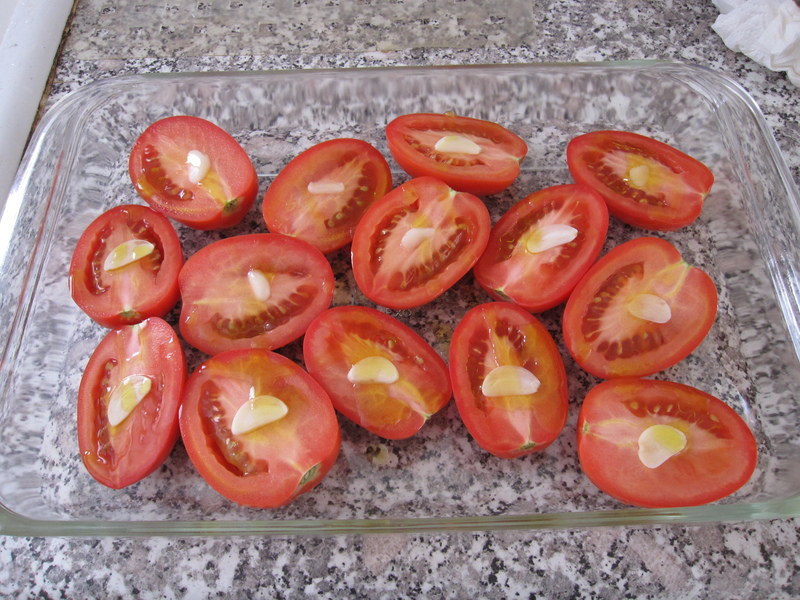 I laid them in a baking dish cut side up and topped each with a slice of garlic. Then I drizzled some olive oil on top and roasted them in a 400 degree oven for an hour. When I took them out I let them cool for about 15 minutes and then tossed it all in my blender until nice and smooth. I thought about straining it, but I decided that I wanted the texture of the pulp. Right before I reheated the soup I threw in a large handful of chopped basil and seasoned with salt and pepper. I garnished the soup with a pinch of parmesan. 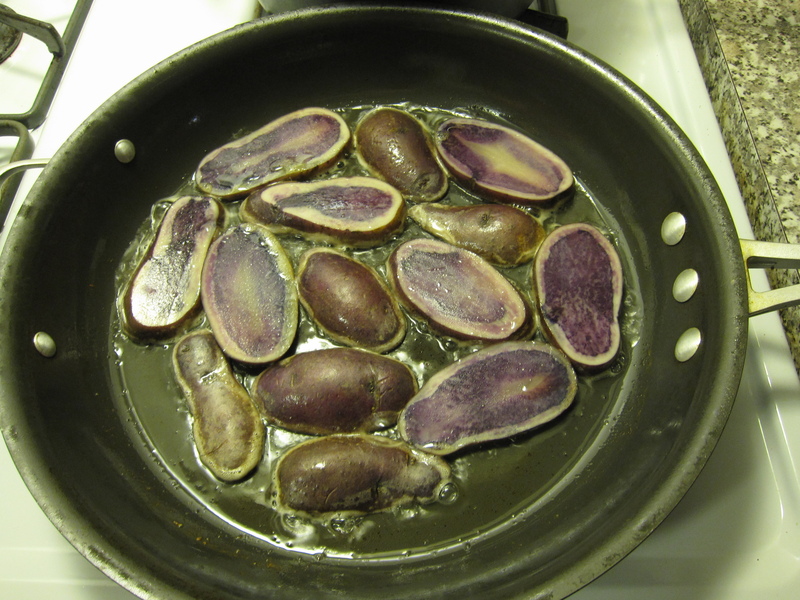 Even though potatoes are a starch, I treated them more as a regular vegetable. I served some white rice alongside for the starch. 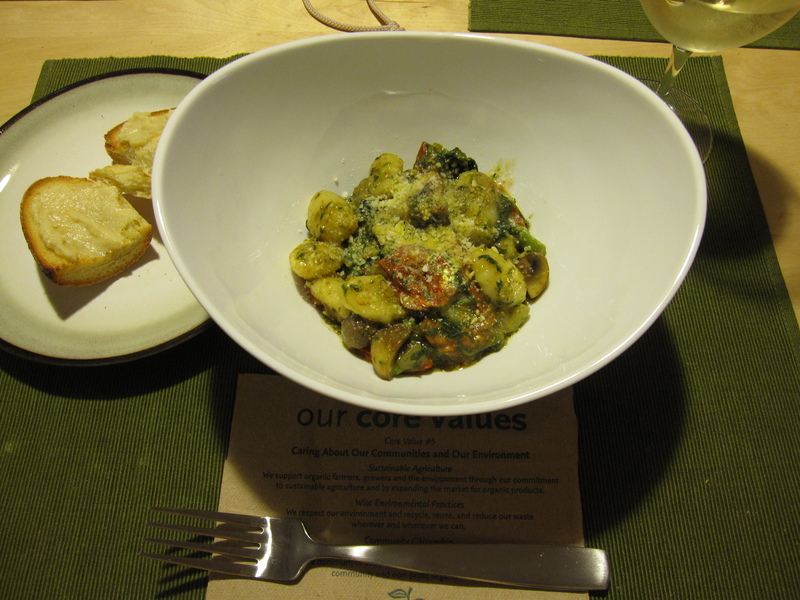 Meatless Monday this week was gnocchi. I do have to say that I cheated a little. I didn’t make my own gnocchi. It’s not hard to make, but it does take time. Time is what I lacked. 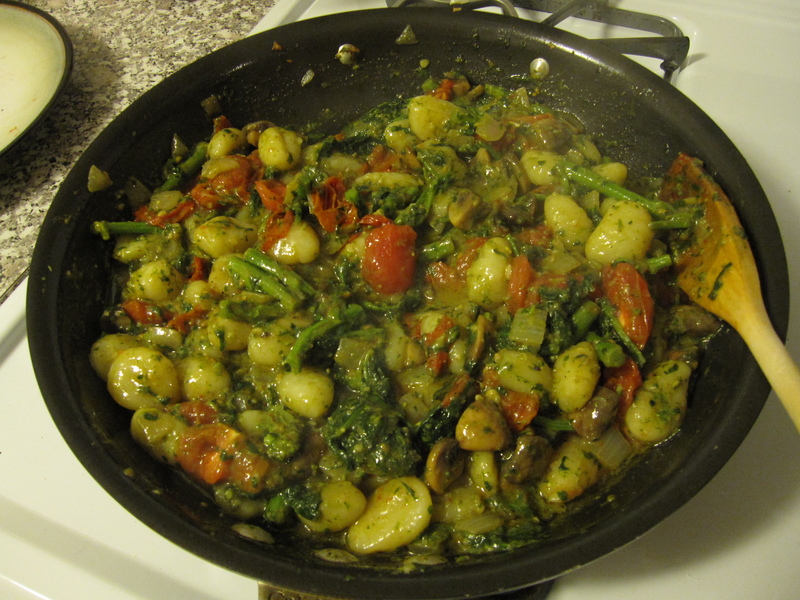 However, most people don’t make their own pasta, so using pre-made gnocchi isn’t really that bad I guess. What’s the difference? Just use a good quality gnocchi. 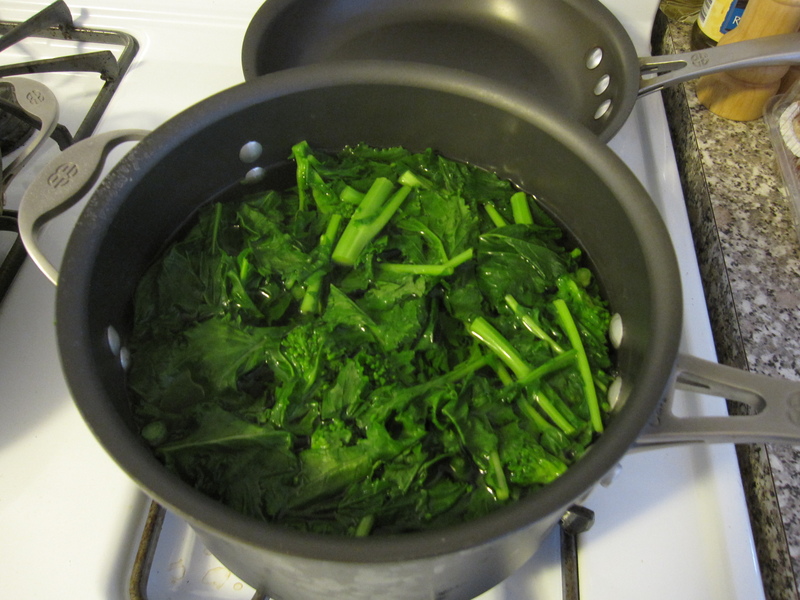 First thing I did was boil some chopped rapini in salt water for about 3 minutes. Rapini can be really bitter and strong. Boiling it for a few minutes removes a lot of the bitterness. Drain it well afterword and squeeze out all of the water. I made some pesto. Just a classic pesto. 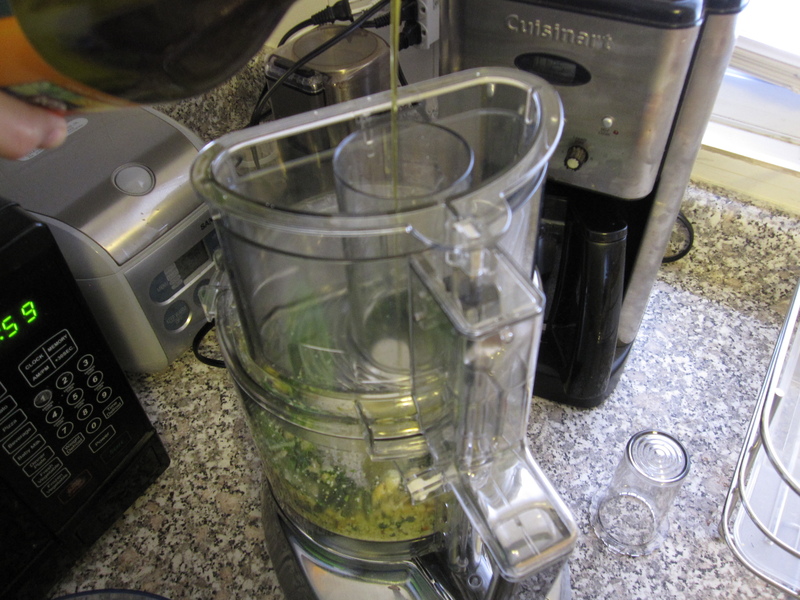 Some basil, garlic, pine nuts, parmesan, salt, pepper, and I like to throw in a pinch of red pepper flakes all into the blender and let her rip while slowly pouring in some olive oil. I think I ended up pouring in about 1/3 cup or so. It all depends upon how much of the other ingredients you put in. Do what you dig. 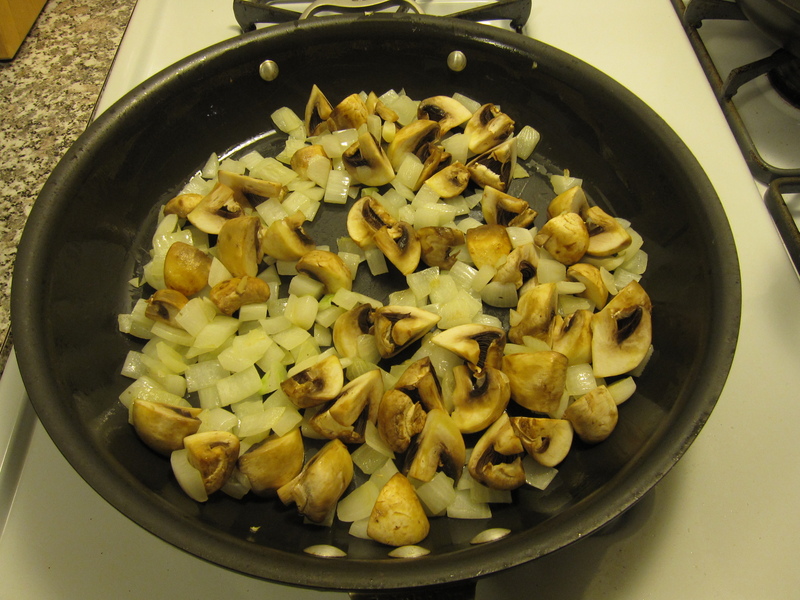 In a large pan I sautéed a chopped onion and a bunch of quartered mushrooms in olive oil with garlic. I let them go until the onion got a little translucent and the mushrooms started to release some of their liquid. 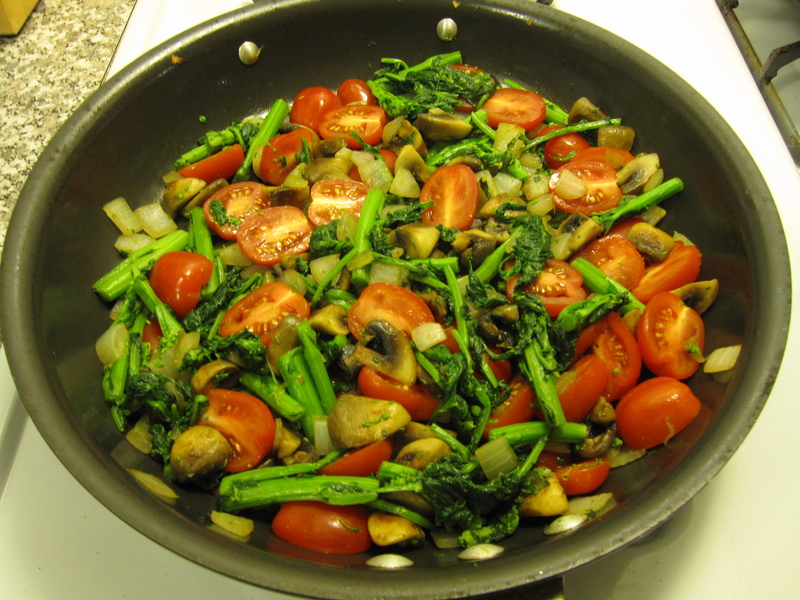 Then I threw in the rapini and a bunch of cherry tomatoes that were halved. I let them go for just a couple of minutes. Once the tomato skins started to wilt a little I tossed in the gnocchi (I had boiled it while cooking the veggies) and spooned in some of the pesto. I mixed it all around and the it cook for just a minute to bring all of the flavors together. To serve, I tossed a little fresh parmesan on top. 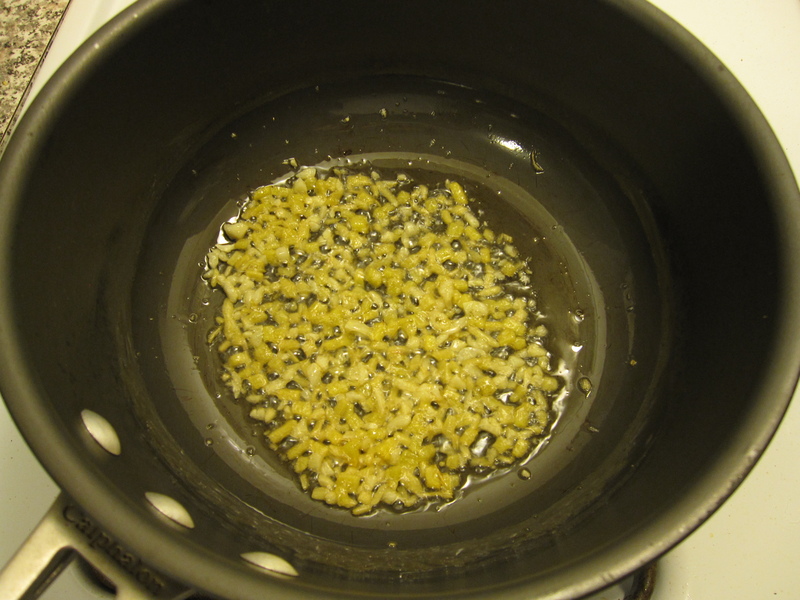 On the side I toasted some bread and spread some artichoke and garlic in olive oil puree on top. Alright, so I didn’t cook last night, nor did I post anything yesterday. 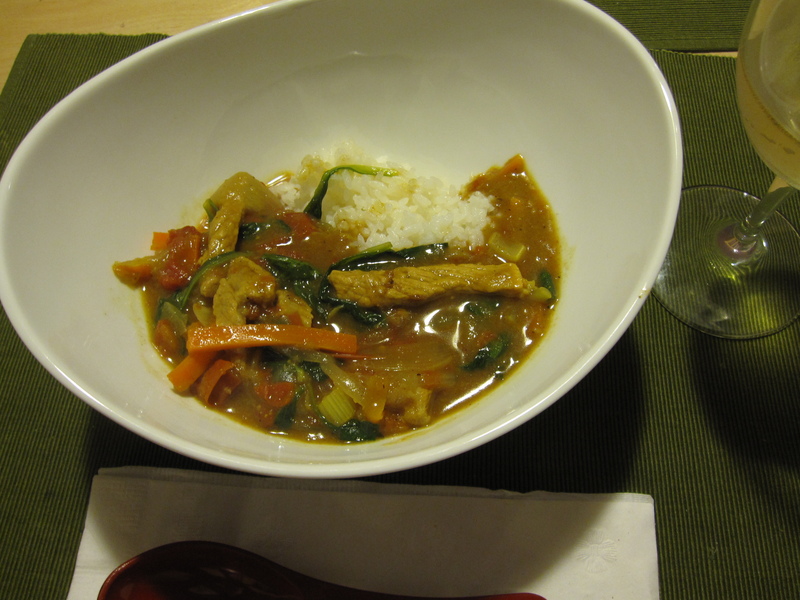 In light of that here’s what I made Wednesday night, a Pork Curry. 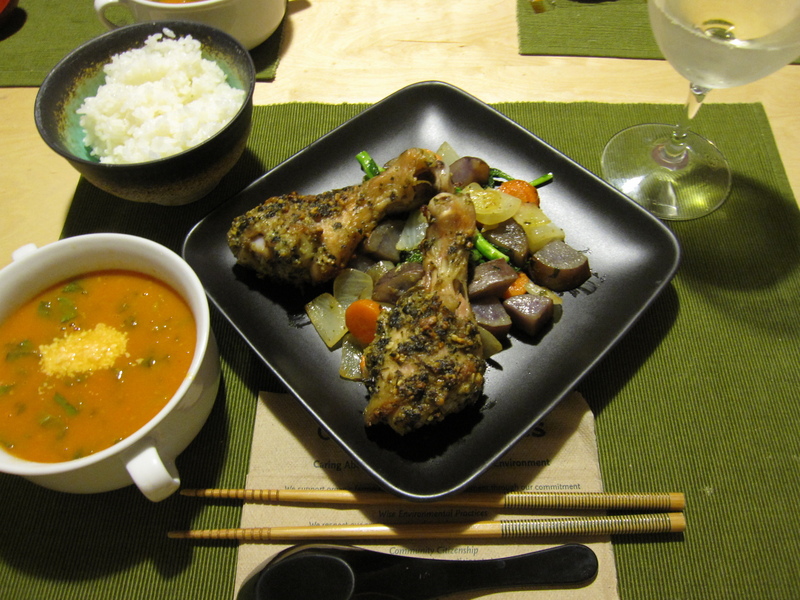 This recipe came from my father-in-law in Japan. He was very excited when he sent it over and translated it into English for me. Some of the measurements that I used are a little different from his since he’s on the Metric System. I also did a couple of things different. Overall my dish was pretty true to his recipe. 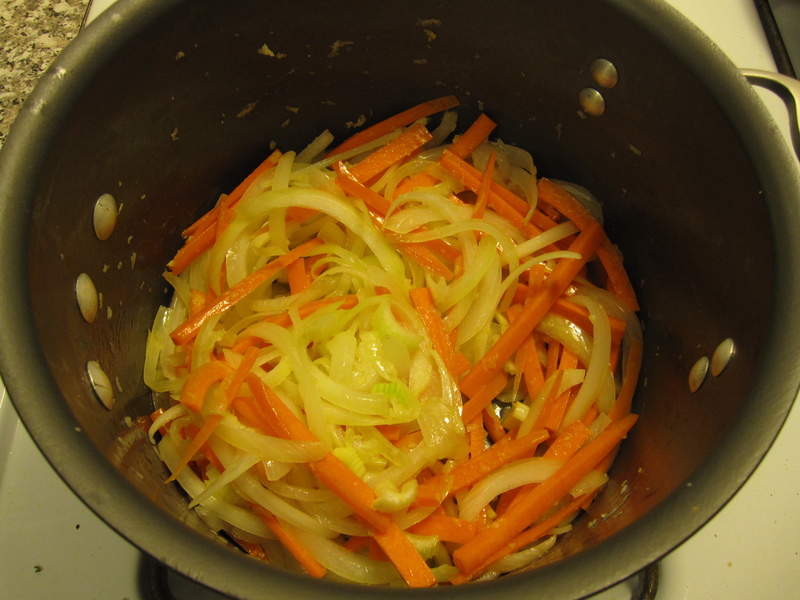 To start, I sautéed a sliced onion, a shredded carrot, and two ribs of celery chopped in some soy oil with garlic and ginger. Uichiro adds a little butter, I didn’t because I’ve been eating a lot of butter lately. I need to keep my girlish figure. Once the vegetables were sweated down for about 7 minutes I added about 2/3’s of a pound of pork chops that I had sliced to about 1/4 inch width. I let the pork cook just until the exterior turned white but the insides were still uncooked. Then I added 2 tablespoons of curry powder, about a teaspoon of black pepper, 5 tablespoons of flour, 1 tablespoon of garam masala, and 1 teaspoon of turmeric. I stirred that all in and sautéed for a few more minutes. Then I poured in 50 ml of white wine and let it boil down. 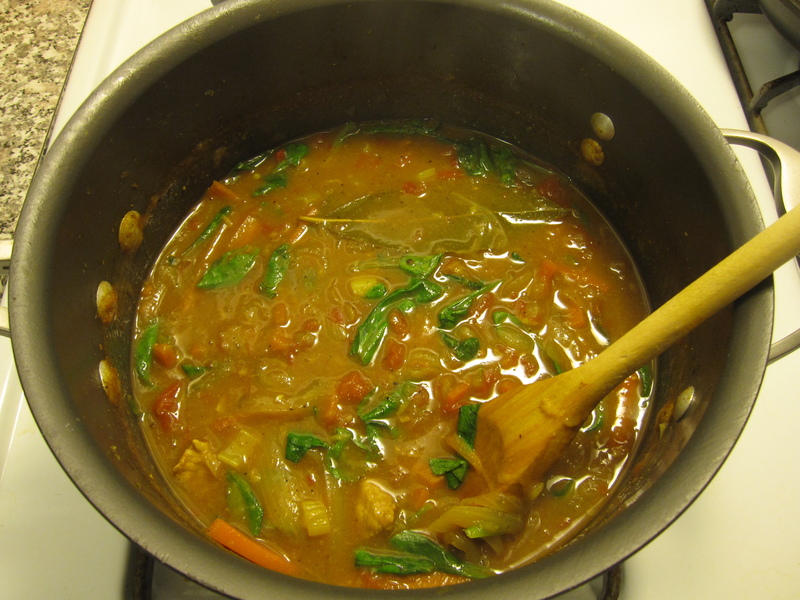 Once the wine had boiled down I added three cups of water, a 14 oz can of diced tomatoes (Uichiro chopped 1 cup of fresh tomatoes), 1 tablespoon of soy sauce, 1 tablespoon of Worcestershire sauce, once chicken bouillon cube, a bay leaf, salt, and pepper. 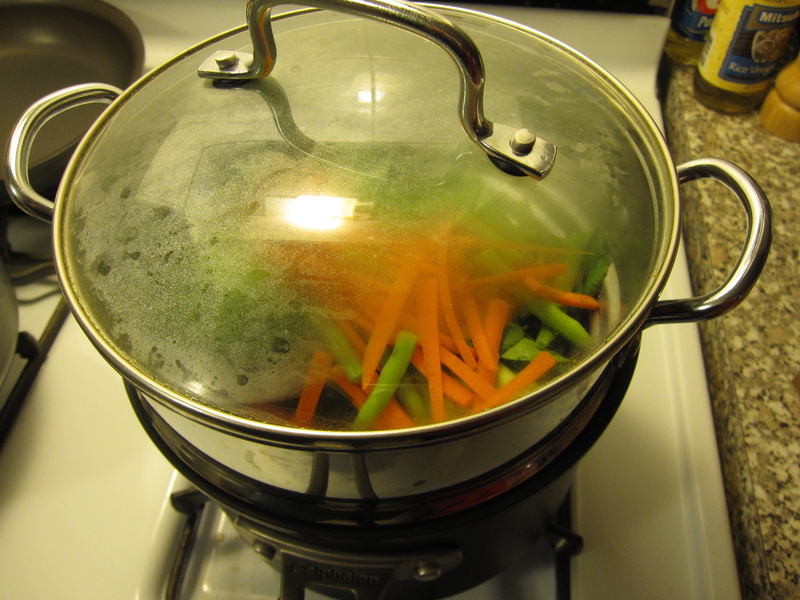 Once that all came to a boil I covered it and turned the heat down to med-low. That simmered for about 40 minutes. After the 40 minutes I took a half an apple and grated it into. This adds a lot of sweetness as well as some starch to help the flour thicken it up a bit. I also added a large pinch of sugar to help balance out the spice. 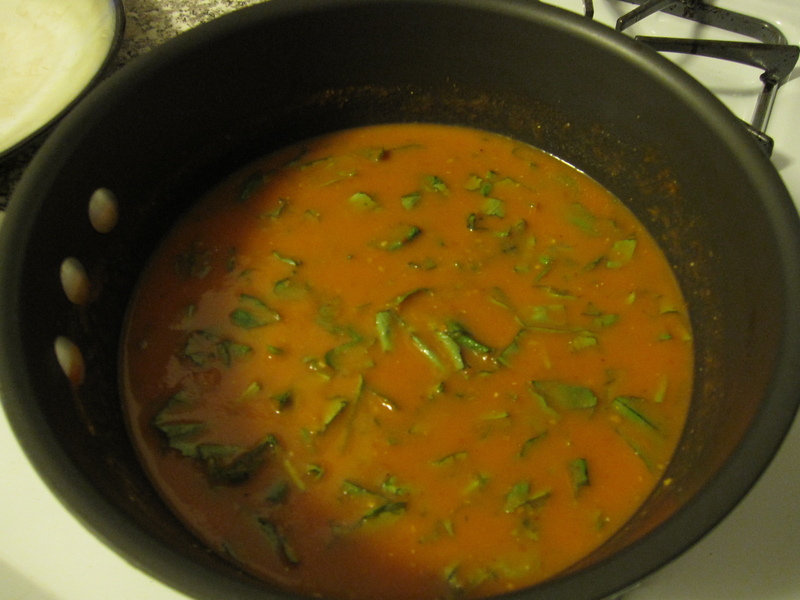 To add a green element to the curry I threw some mache leaves in right after turning off the heat. Uichiro didn’t do that. It really didn’t need it, I just wanted to add the color. Overall, I have to say, it’s another winner from Uichiro. Next time I think I’ll use about a half cup less water, but otherwise it was delicious. I am disappointed that he didn’t have a cool name for the dish though. He calls his meatloaf “cool breeze amongst the pine trees”. I have no idea why, but it is a damn good meatloaf!